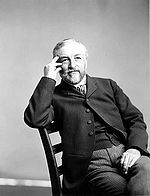 Samuel Pierpont Langley (August 22, 1834, Roxbury, Massachusetts - February 27, 1906, Aiken, South Carolina) was an American astronomer, physicist, inventor of the bolometer and pioneer of aviation. He attended Boston Latin School, graduated from The English High School, was an assistant in the Harvard College Observatory, then became chair of mathematics at the United States Naval Academy. In 1867, he became the director of the Allegheny Observatory and a professor of astronomy at the Western University of Pennsylvania, now known as the University of Pittsburgh, a post he kept until 1891 even while he became the third Secretary of the Smithsonian Institution in 1887. Langley was the founder of the Smithsonian Astrophysical Observatory. In 1886, Langley received the inaugural Henry Draper Medal from the National Academy of Sciences for his contributions to solar physics. His publication in 1890 of infrared observations at the Allegheny Observatory in Pittsburgh together with Frank Washington Very was used by Svante Arrhenius to make the first calculations on the greenhouse effect. Picture - Langley's steam-powered Ax�rodrome No. 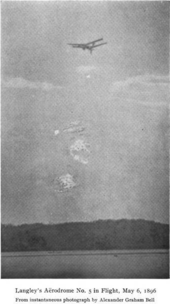 5 in flight, May 6 1896. Photo by Alexander Graham Bell. Langley attempted to make a working piloted heavier-than-air aircraft. His models flew, but his two attempts at piloted flight were not successful. Langley began experimenting with rubber-band powered models and gliders in 1887. (According to one book, he was not able to reproduce Alphonse P�naud's time aloft with rubber power but persisted anyway.) He built a rotating arm (functioning similar to a wind tunnel) and made larger flying models powered by miniature steam engines. 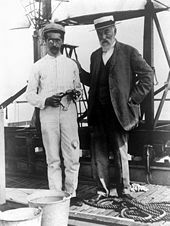 His first success came on May 6, 1896 when his Number 5 unpiloted model flew nearly 3/4 of a mile after a catapult launch from a boat on the Potomac River. The distance was ten times longer than any previous experiment with a heavier-than-air flying machine, demonstrating that stability and sufficient lift could be achieved in such craft. On November 11 that year his Number 6 model flew more than 5000 feet. In 1898, based on the success of his models, Langley received a War Department grant of $50,000 and $20,000 from the Smithsonian to develop a piloted airplane, which he called an "Aerodrome" (coined from Greek words roughly translated as "air runner"). Langley hired Charles M. Manly (1876-1927) as engineer and test pilot. When Langley received word from his friend Octave Chanute of the Wright brothers' success with their 1902 glider, he attempted to meet the Wrights, but they politely evaded his request. While the full-scale Aerodrome was being designed and built, the internal combustion engine was contracted out to manufacturer Stephen Balzer (1864-1940). When he failed to produce an engine to the power and weight specifications, Manly finished the design. This engine had far more power than did the engine for the Wright brothers' first airplane-50 hp compared to 12 hp. The engine, mostly the technical work of men other than Langley, was probably the project's main contribution to aviation. The piloted machine had wire-braced tandem wings (one behind the other). It had a P�naud tail for pitch and yaw control but no roll control, depending instead on the dihedral angle of the wings, as did the models, for maintaining roughly level flight. In contrast to the Wright brothers' design of a controllable airplane that could fly against a strong wind and land on solid ground, Langley sought safety by practicing in calm air over the Potomac River. This required a catapult for launching. The craft had no landing gear, the plan being to descend into the water after demonstrating flight which if successful would entail a partial, if not total, rebuilding of the machine. Langley gave up the project after two crashes on take-off on October 7 and December 8, 1903. In the first attempt, Langley said the wing clipped part of the catapult, leading to a plunge into the river "like a handful of mortar," according to one reporter. On the second attempt the craft broke up as it left the catapult (Hallion, 2003; Nalty, 2003). Manly was recovered unhurt from the river both times. Newspapers made great sport of the failures, and some members of Congress strongly criticized the project. The Aerodrome was heavily modified and flown a few hundred feet by Glenn Curtiss in 1914, as part of his attempt to fight the Wright brothers' patent, and as an effort by the Smithsonian to rescue Langley's aeronautical reputation. Nevertheless, courts upheld the patent. However, the Curtiss flights emboldened the Smithsonian to display the Aerodrome in its museum as "the first man-carrying aeroplane in the history of the world capable of sustained free flight". Fred Howard, extensively documenting the controversy, wrote: "It was a lie pure and simple, but it bore the imprimatur of the venerable Smithsonian and over the years would find its way into magazines, history books, and encyclopedias, much to the annoyance of those familiar with the facts." (Howard, 1987). The Smithsonian's action triggered a decades-long feud with the surviving Wright brother, Orville. Langley had no effective way of addressing the Wright brothers' central innovation of controlling an airplane too big to be maneuvered by the weight of the pilot's body. So if the Aerodrome had flown stably, as the models did, Manly would have been in considerable danger when the machine descended, uncontrolled, for a landing-especially if it had wandered away from the river and over solid ground. Picture - Langley's 1/4-scale model; it flew several hundred yards on August 8, 1903. Langley invented the bolometer, an instrument for measuring infrared radiation, and used it on astronomical objects. He made one of the first attempts to measure the surface temperature of the Moon, and his measurement of interference of the infrared radiation by carbon dioxide in Earth's atmosphere was used by Svante Arrhenius in 1896 to make the first calculation of how climate would change from a future doubling of carbon dioxide levels. "Vita ed opere dell'astronomo e costruttore aeronautico Samuel Pierpont Langley" by Ciampaglia Giuseppe. Rivista Storica. Gennaio 1996.